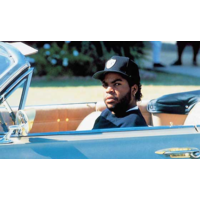 O'Shea Jackson (born June 15, 1969), better known by his stage name Ice Cube, is an American rapper, actor, screenwriter, film director, and producer. He began his career as a member of the C.I.A and later joined the rap group N.W.A. After leaving N.W.A in 1989, he built a successful solo career in music, and also as a writer, director, actor and producer in cinema. Additionally, he has served as one of the producers of the Showtime television series Barbershop and the TBS series Are We There Yet?, both of which are based upon films in which he portrayed the lead character. He married Kimberly Woodruff in 1992, with whom he has four children (three boys, one girl). From the 2000s onwards, Jackson focused on acting, and his musical output has slowed down considerably.